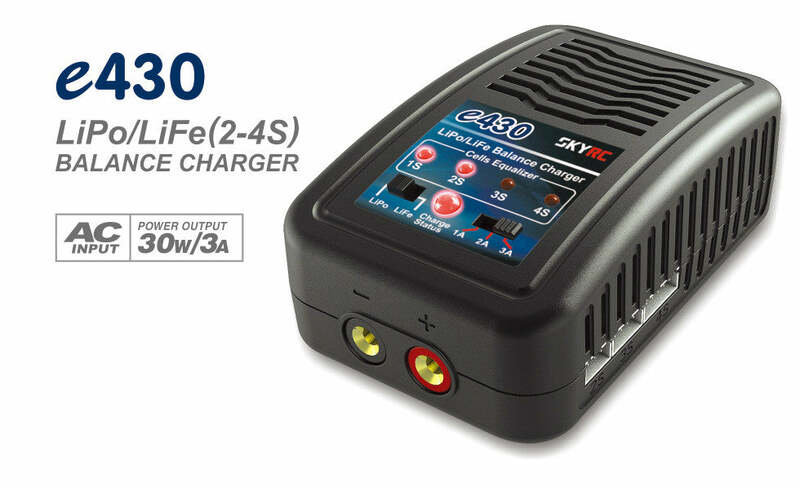 The SkyRC e430 30 Watt charger is an economic, high quality 100-240V AC balance charger designed for charging LiPo and LiFe batteries from 2-4 cells in balance mode. The circuit power is 30W and max charge current can reach up to 3A. There are three kinds of charge currents 1A/2A/3A that can be selected. You can select the proper charge current according to the battery capacity. 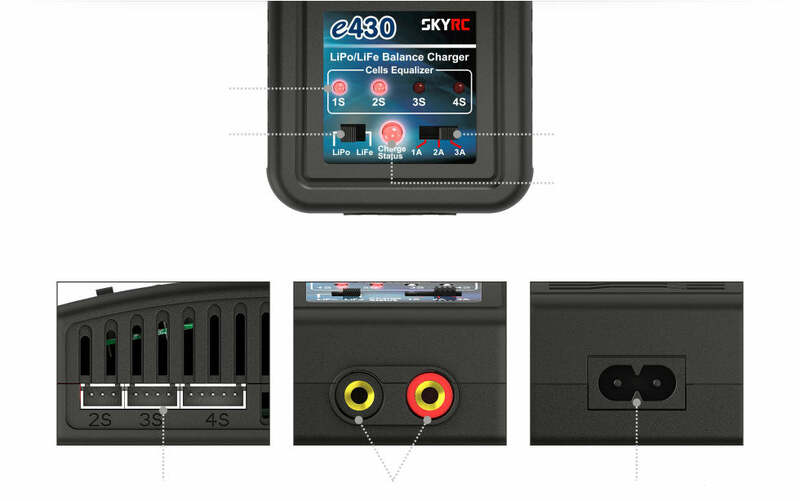 There is one LED indicating the charge status (ready to charge/charge in CC mode/charge in CV/ mode/charge finish) and four LEDs indicating each battery cell status (charge/discharge), which allows you to monitor the charging process at all times. The operation of the e430 is also very simple. There are two toggle switches in the charger which can be used to selected battery type and charge current. Never, under ANY circumstances, leave your charger unattended while charging a LiPo battery. Keep the charger away from moisture, dust, direct sunlight, or any heat sources. The charger should always be placed on a heat-resistant, non-flammable surface during charging. Never overcharge or exceed a 1C charge current. A 1C charge current means the charge current equals the capacity of the battery. For example, a 2200mAh battery should never be charged using a current greater than 2.2 Amps (2200mAh).